Christmas markets (Weihnachtsmärkte), Glühwein, sausages, Lebkuchen biscuits, potato cakes, sweets, wooden toys, and music are the highlights of Advent in Germany. German Christmas markets (Weihnachtsmärkte) are outdoor markets held in the month leading up to Christmas. The exact composition of Christmas markets vary from market to market. However, all Christmas markets have stalls selling food and Christmas related wares. Food at Christmas markets include Glühwein (warm, spiced wine), Kinderpunch (spiced fruit juice), Lebkuchen ginger bread cakes, sausages, potato cakes, and baked items. On sale are also Christmas tree decorations, candles, wooden toys, and sweets. Larger markets usually have simple rides aimed at small children. Many markets also have life music. German Christmas markets generally do not sell cheap plastic imports or clothing (but these are easily found at supermarket or discount stores). The names of German Christmas markets vary from region to region. Weihnachtsmarkt (plural Weihnachtsmärkte) is Christmas market in High German and understood everywhere. Regional variations are common – for example in Dresden it is the Striezelmarkt, in Rothenburg the Reiterlesmarkt, while in most of Bavaria (and Austria) Christkindlmarkt (spelled in various forms) is more common. When Are German Christmas Markets Open? German Christmas markets are generally held the Advent month preceding Christmas. In larger cities and popular tourist towns, the markets usually functions daily from November 25 to just before Christmas. Christmas markets usually close on December 23 at the latest. In Germany, Christmas markets are usually not held on December 24 or December 25. A notable exception is in Berlin where some of the Christmas markets extend into the New Year and are open on December 25. Even in Berlin, no Christmas market will function on the evening of December 24 but a few are open in the afternoon. Other larger cities and tourist resorts are also keen to extend Christmas markets for the tourist trade but it is still mostly over a day or two before Christmas itself. In smaller towns, markets are generally held only on weekends or sometimes just one or two weekends – often the first two in December. The exact hours similarly vary from Christmas market to Christmas market. Generally, markets are active from around 10 am to 8 pm. The best times to visit is late afternoon, early evening – darkness and lights simply do it for the atmosphere. Markets are generally the busiest on Friday and Saturday evenings. When traveling, a good time to arrive in a city such as Nürnberg that is famous for it Christkindlesmarkt is on Sunday. Flights, and especially hotel accommodation, may be cheaper for Sunday arrivals and Christmas markets are generally quieter on Mondays. 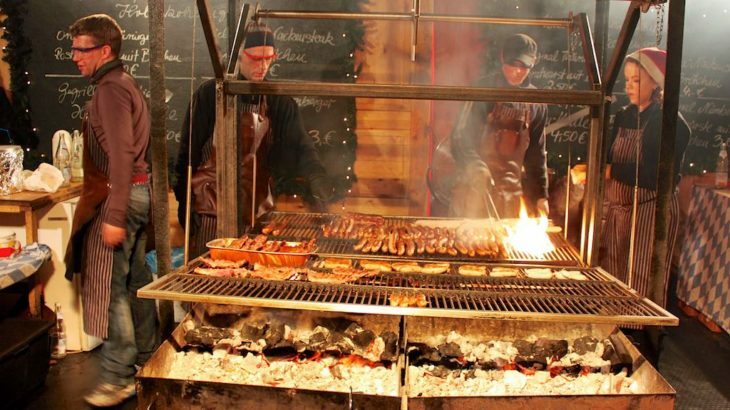 Sausages (Wurst or Würstchen) in all shapes, lengths, and forms are usually grilled over an open or charcoal fire and sold in a bun. The bread is basically used to hold the warm sausage in – condiments including ketchup, mustard, mayonnaise, and pickles are generally available for self service. Sausages vary by region – best is simply to point at what looks good. Potato cakes are thick pancakes made from grated potato, flour, and a range of other possible ingredients. The names vary but of the around 30 variants Kartoffelpuffer and Reibekuchen are the most widely understood. Potato cakes are often served with applesauce or other side dishes and are frequently the best value for money at Christmas markets. Baked items – these range from region to region too but waffles and crepes are standard items at all markets. Sweets – sugary stuff in all shapes and sizes, nuts, dried fruits, candies, chocolates, gingerbread and Lebkuchen are popular. Glühwein (mulled red wine) is the standard drink served in decorated mugs. Sometimes flavors such as cherry or stronger alcohol (mit Schuss) is added for extra kick. Kinder Punch (Children’s Punch) is the standard non-alcoholic drink. It is warm fruit juice – usually orange or apple – with the same spices added as to Glühwein. Hot chocolate, coffee, and tea are also available. A Pfand (deposit) is added to the price of drinks. The deposit is refunded if the mug, which makes a popular souvenir, is returned. Depending on the market, the mugs are returned to the original stall or to a special central collection point – generally a better solution to ensure it is properly washed. Which German Christmas Market to Visit? The Christmas market in Nürnberg (Nuremberg) is the most famous, in Frankfurt the biggest, in Dresden the oldest while Berlin has the largest number. However, Christmas markets are in essence the same. However, for some difference, tips, and pointers see Christmas Markets in Germany.